I grinned. Shocked…and impressed. She pays attention. Music appreciation in its developing stages. Love it! We play various genres of music around our home. Depending on the day (or mood), you may hear Michael Jackson or Hillsong, John Coltrane or Israel or Bach. It both tickles and pleases me, however, that the most requested by Enoch are Michael Jackson or jazz. 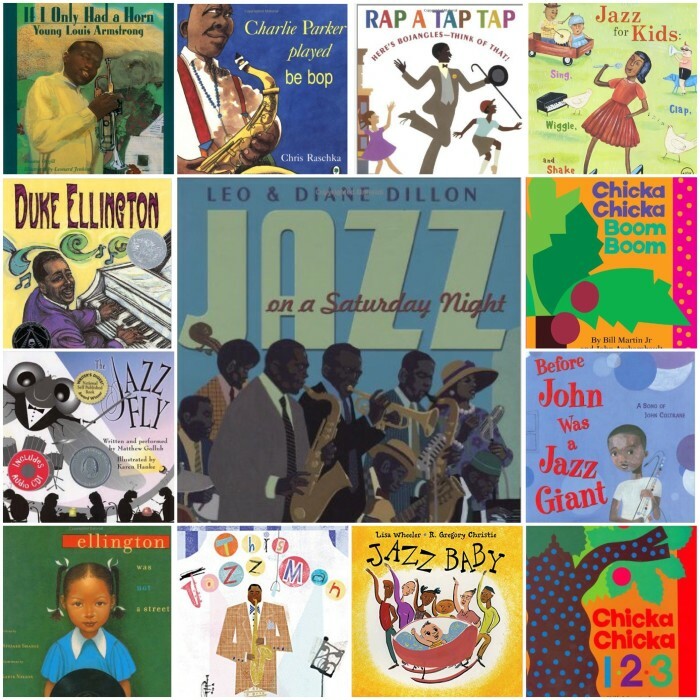 So, in honor of our family’s growing appreciation of jazz, the fact that April is Jazz Appreciation Month, and National Library Week, I’ve decided to put together a post of 12 “jazzy” books (along with a great CD called Jazz for Kids: Sing Clap Wiggle & Shake ). I hope your family has as much fun as we have! Jazz On A Saturday Night (Coretta Scott King Honor Book) is a fun, beautifully illustrated, simple introduction to jazz for children. The authors create a fictitious band comprised of jazz greats such as Miles Davis, Charlie Parker and Ella Fitzgerald, playing their respective instruments. A bonus is a CD which includes additional information about jazz and all of the instruments included in the book. This Jazz Man is one of my children’s favorites. Written to the tune of, “This Old Man”, they love tapping and conducting and drumming while counting. The bonus is Ehrhardt also introduces the different musicians and instruments that can comprise a jazz band. The end of the book identifies each of the band members as a famous musician – such as Louis Armstrong, Duke Ellington, and Charles Mingus. The Jazz Fly (book w/ audio CD) is a story about a fly lost on his way to a jazz performance with some wriggly friends. Along the way he meets a few animals who later inspire his performance. As the author notes, it’s a story about ingenuity, improvisation, and interpretation. Bonus CD is included. Chicka Chicka 1, 2, 3 is a companion to Chicka Chicka Boom Boom. Bill Martin uses similar “jazzy” humor to teach numbers 1 through 20, and multiples of ten. Before John Was a Jazz Giant: A Song of John Coltrane by Carole Boston Weatherford tells the story of the sounds that inspired a young John Coltrane growing up with family in the South in the 1930s. It’s a wonderful way to encourage children to observe their surroundings and the sounds we tend to take for granted in every day life. A short biography is included at the end along with additional recommended reading and music. Written by poet and playwright, Ntozake Shange, she takes young readers into her childhood home in Ellington Was Not a Street . I love how she piques children’s interest by pointing out there are often people behind street names. 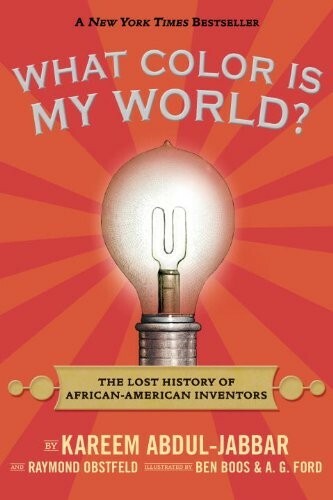 Children are introduced to nine famous artistic, intellectual and athletic African-American “Men who changed the world” like Paul Robeson, Dizzy Gillespie, Duke Ellington and more. The beautifully illustrated book also provides brief bios. Rap a Tap Tap: Here’s Bojangles – Think of That! (Coretta Scott King Illustrator Honor Books) Les and Diane Dillon take readers on a lively, rhythmic trip following Bill “Bojangles” Robinson, called the greatest tap dancer of all time. We see him following his passion and sharing it with all that he meets, at all times in various places. Prepare for dancing. Charlie Parker Played Be Bop , this picture book about Charlie Parker relies on your children’s imagination to hear the music. “Be bop, Fisk, Fisk…chickadee, chickadee, chickadee, chick.” They will laugh while learning to appreciate and hear rhythm. Jazz Baby. I caught the girls “reading” this book today, saying “Mama sings high. Daddy sings low. Baby says GO….”. Memorable. Rhyme. Rhythm. Repetition. Booms and bops, dancing and singing. What better way to introduce little ones to jazz than through a jazzy baby? Duke Ellington: The Piano Prince and His Orchestra You can almost hear the low, slow, smooth talking voice of a “jazz man” telling the story of Duke Ellington and the formation of his orchestra. “Now you’ve heard of the jazz-playin’ man. The man with the cats who could swing with his band.” This book is as colorful as Duke’s personality and history- from giving himself the nickname “Duke” as a child, initially rejecting piano as a “umpy-dump sound that was headed nowhere worth following”, to ending up one of greatest composers of the 20th century, playing at Carnegie Hall. Jazz for Kids: Sing Clap Wiggle & Shake “Old MacDonald Had a Farm” and “The Muffin Man” by Ella Fitzgerald. A song about “Potato Chips”. “What a Wonderful World” by Louis Armstrong. What better way to introduce children to the world of jazz. Perfect for clapping, wiggling and shaking. And history – our history – where for 28 wonderful days (29 this year!!!) the history of people who look like me is told. But, the reality is, it isn’t. I remember being a child and believing my birthday was in February intentionally, because it was Black History month. As if black people could only be born in February. Flawed, and heart-breaking. I later came to celebrate that I was born in a month when I saw pictures and heard stories of people who looked like me – for 28 days straight. Now, we do read books throughout the year with stories and faces of “brown people” (as Enoch calls us). We also read stories with faces of people who look nothing like us -people with almond shaped eyes, or peach, yellow or dark brown skin, people whose written languages look like jumbled letters or pictures. Because, we need to see, love and appreciate people who are not like us. But I love February. It is a special pleasure to make a big deal out of how God created us, in a world that often ignores and degrades us. I revel in the opportunity to have an intentional time to learn about the gifts He gave the world wrapped in “brown packages”. Brown packages which are often tossed aside with people assuming negative things about its contents. This month, beautiful “brown packages” are wide open and celebrated! Prior to having little ones, I had lofty ideas of how we would celebrate Black History Month. Books we would read, trips we would take. But, now, they are here. Those lofty ideas have given way to practicality for their ages and our current season of life. Then, this statement… “There’s more to our history than slavery, jazz, sports and civil rights marches.” And with that, he proceeds to give them the history of 16 different African American scientists and inventors – a nuclear engineer, a bread machine creator, a heart surgeon, among others. For those interested in learning more, there is also a list of additional resources provided at the end of the book. Happy Black History Month – make it a fun, fruitful and educational one!